Research activities relating to data envelopment analysis (DEA) have grown at a fast rate recently. Exactly what activities have been carrying the research momentum forward is a question of particular interest to the research community. This study finds these research activities, or research fronts, as well as some facts on applications in DEA. A research front refers to a coherent topic or issue addressed by a group of research articles in recent years. The large amount of DEA literature makes it difficult to use any traditional qualitative methodology to sort out the matter. Thus, this study applies a network clustering method to group the literature through a citation network established from the DEA literature over the period 2000–2014. The keywords of the articles in each discovered group help pinpoint its research focus. The four research fronts identified are “bootstrapping and two-stage analysis”, “undesirable factors”, “cross-efficiency and ranking”, and “network DEA, dynamic DEA, and SBM”. Each research front is then examined with key-route main path analysis to uncover the elements in its core. In the end, we present the prevailing DEA applications and the observed association between DEA methodologies and applications. The authors would like to express their gratitude Professor Joe Zhu for providing guidance and critiques in several aspect of this research project. Our gratitude extends to several reviewers for their constructive comments, which have greatly improved the accuracy and readability of this article. This work is partially supported by Taiwan’s Ministry of Science and Technology grant NSC 102-2410-H-011-008-MY3, NSC 102-2410-H-155-021-MY3, and NSC 102-2632-H-155-001-MY3. Part of this chapter is based upon “John S. Liu, Louis Y.Y. 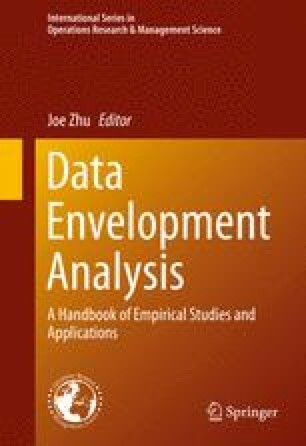 Lu, and Wen-Min Lu, “Research fronts in data envelopment analysis”, OMEGA, Vol. 51, (2016), 33–45.”, with permission from Elsevier.